Ligularia is a sort of perennial plants belonging to the family of Compositae, or Asteraceae. However, it’s carried a taxon of Ligularia to the sort Groundsel (Senecio) earlier. From 150 – 170 of its types differing with the stalk height, a form of leaves and coloring of inflorescences only about 10 found application in culture. In a wild-growing form this plant is widespread mainly in damp districts in Asia, China, some regions of Europe. 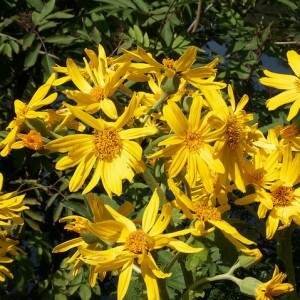 The Latin name received a plant thanks to the reed flowers, the word "ligularia" and is translated as "uvula". The plant has round-form roots about 50 cm; direct stalks to 200 cm; large leaves, a form and which coloring depend on a grade; inflorescences baskets (diameter about 10 cm) which can be white, yellow, orange or brown coloring. Blossoming comes in summertime and about two months proceed, and at cool weather – even more long. At some grades unusual coloring of leaves meets: from the lower party a leaf of purple color, with top – green-violet, thus veins can be red. Liguaria’s fruit represents a seed of an oblong form.